Learning via correspondence courses has been around for several decades – take, the Open University, for example, which has been in existence for around 40 years. However, it has been computerisation and the explosion of new types of communication technologies which has revolutionised online distance learning in education. This has become one of the major factors in distance learning becoming increasingly popular as it allows so much more flexibility and accessibility. Interaction that takes place within online distance learning courses can be broadly broken down into two distinct categories – synchronous and asynchronous communication. Synchronous communication occurs in real time, similar to that of a face to face or telephone conversation. With asynchronous communication, this means that there is a time lag between individual communications. This does not, however, necessarily mean that asynchronous communication isn’t as effective as synchronous. It’s quite the opposite in fact. In online distance learning, asynchronous communication is sometimes far more effective. Here are some examples of the most common forms of communication technologies which facilitate online distance education. 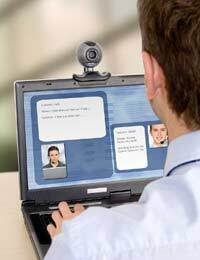 There are other less noticeable ways in which communication technologies facilitate online distance learning. SMS/text messages or voicemail, for example, can be used to let online students know of an impending deadline for a particular assignment or to let them know a new lecture has been recorded and made available as a podcast. Because of the never ending advancement in communication technology, it has certainly revolutionised distance learning from what it was a decade ago and has broadened its appeal.